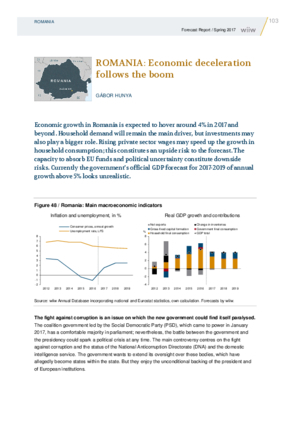 Economic growth in Romania is expected to hover around 4% in 2017 and beyond. Household demand will remain the main driver, but investments may also play a bigger role. Rising private sector wages may speed up the growth in household consumption; this constitutes an upside risk to the forecast. The capacity to absorb EU funds and political uncertainty constitute downside risks. Currently the government’s official GDP forecast for 2017–2019 of annual growth above 5% looks unrealistic.